The Compulsive Reader: Reading Rants: Time Travel Love! During my more self-centered moments, I like to believe that I am pretty good at predicting trends and such. And one thing I have been bemoaning for months and months and months is the severe lack of time travel books in YA, so when The Time Traveler's Wife came out and was pretty successful, I was certain this had to mean all these authors would start diving into the past and bring us more great time-travel lit. But anyway, enough narcissistic rambling...I've counted something like eight--EIGHT--time travel books to be released in 2011, and I am pumped! 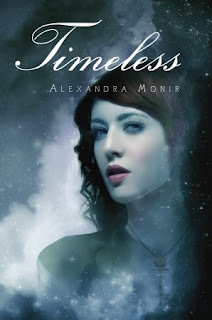 I just finished reading Timeless by Alexandra Monir, and wow, wow, wow! It was excellent! An official review will come soon, but in the meantime, check out the trailer! Another really cool thing I liked about this book is that Alexandra Monir, who is also a singer and songwriter, had two of the songs composed in the book produced for her readers! They're called "Bring the Colors Back" and "Chasing Time", and you can find them on iTunes. They're excellent, very jazz-y, but modern too (I am so much better at attaching adjectives to books rather than music, so just take my word for it--the songs rock). PLUS, the book was named one of Amazon.com's Best Books of January 2011! So, go read Timeless! Then go listen to the music! You won't regret it, I promise! I've only read a couple of Time Travel books, and those were romance (very cute, btw, Teresa Medeiros' Lennox series). But I've heard such a great things about this book (can't wait to read your review) that I so want to read it. The cover is gorgeous! That's really interesting that there is going to be so many time travel books. I can't say that I've really found one that I've liked so far, but i'll have to give the 2011 books a chance.